Likewise, great inspiration can be found in complementary art forms. A poet can conjure new ideas from a dance; a musician can be moved to compose by a script. I a primarily a writer of prose fiction but as an Art College alumna – when I’m looking for inspiration, I go to an art gallery. 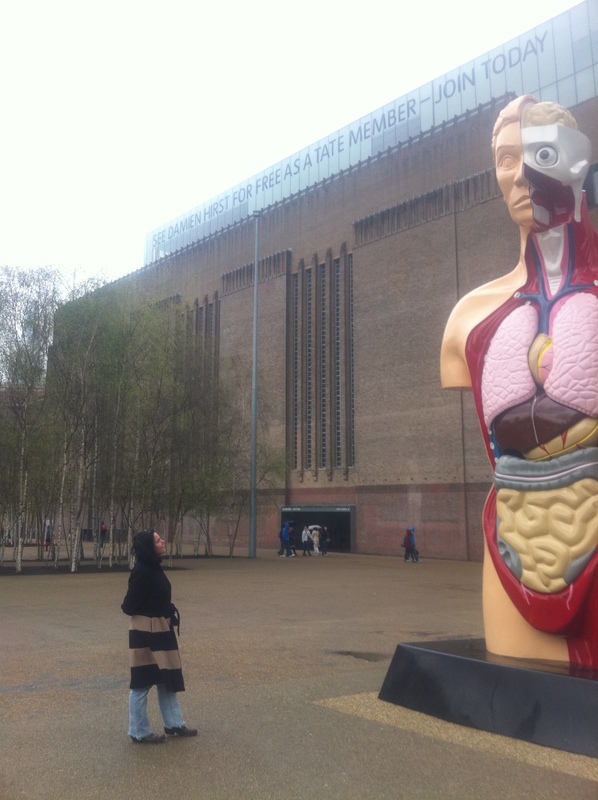 I went with a housemate on a field trip to London last week to see the Damien Hirst retrospective at the Tate Modern, the Picasso at the Tate Britain and the Freud at the National Portrait Gallery. All three were fruitful visits but, it was Hirst that had me stunned and flushed with ideas. I’d seen Hirst’s ‘Shark’ before and was struck then by the concept that the creature did not know he was dead. The retrospective examines death in more detail. Death, an inevitable aspect of life, is not morbid in Hirst’s world, however. Rather it is presented as a beautiful climax (Diamond Skull). Dead butterflies are arranged in stunning giant mosaics reminiscent of great stained glass windows. Even a grand wall-size black circular ‘sun’, composed of a million dead flies has all the elegance and plush luxury of a carpet fit for the feet of kings. Life/death – this complementary nature of opposites runs throughout the artist’s work. The mundane, even ugly are elevated to beautiful objets d’art. A classically sculpted marble angel reveals insides weird and devilish. A dead, fly infested cow’s head celebrates life cycles. Hirst’s work tells us that opposites need each other to exist. Opposites are each other. Rock it, Damien. This entry was posted on Thursday, May 3rd, 2012 at 19:48	and tagged with Art, art forms, damien hirst, inspiration, writer, writers, writing, writing exercise and posted in Uncategorized, Writing. You can follow any responses to this entry through the RSS 2.0 feed. Haven’t seen Hirst, but art is inspiring. And Death can be positive, part of life. Liked this blog. I loved how you described what you saw. You are such a great writer. I never not think that when I visit your site. How lovely this piece of art sounds and how nice it is for you to pull inspiration from it. I can see the piece (I think) even though I’ve never seen the piece before. Thanks for this. And some of my most enlightening conversation of late have been with nonChristians…..